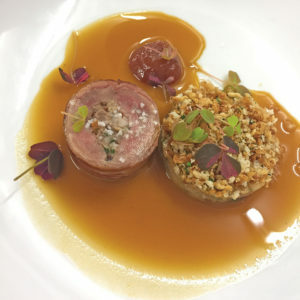 While driving to L’Auberge Provençale for the Hunt Country Four Hands Dinner—a collaboration between Chef Richard Wright of the White Post bed and breakfast and Chef Tom Whitaker of the nearby Ashby Inn and Restaurant—the sky opened up. A deluge of rain spewed from the thunderheads. I ratcheted up my windshield wipers, turned on my hazard lights, and proceeded at a crawl; my date and I weren’t about to miss this dinner over a mere torrential downpour. Two chefs, six courses, Virginia’s finest wines. We were prepared to swim there if it came down to it. Finally, a light at the end of the tunnel in the form of a welcoming, pastoral bed and breakfast. We sprinted through the rain. Inside, a warm, effusive glow spread through the room, along the bar, weaving between eager diners holding their Champagne flutes and bantering in a low murmur as though there wasn’t a rainstorm of near-biblical proportions outside. We were greeted with two glasses of Trump Winery’s 2012 Blanc de Blanc. Sparkling, effervescent, with notes of green apple, lemon, pear, and a hard-to-place mineral component. Though not a Champagne, on account of the wine’s being manufactured in Charlottesville and not France, the effect was the same: buoyant, tingly, and the perfect blend of formality and fun. Then came the wine’s complement: a Canadian Raspberry Point oyster garnished with pomegranate and apple and a hint of cranberry. The briny slickness of the oyster balanced evenly with the pucker-inducing tartness of the cranberry and the splintering crunch of a single pungent pomegranate seed. The combination was potent and reminded me, strangely, of a well-told story in that the conclusion is at once surprising and inevitable. Such a bold and balanced amuse bouche bode well for the six courses to come out of the kitchen of chefs Wright and Whitaker. 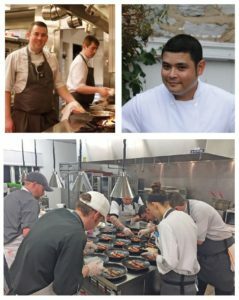 So, who are these leading culinary figures of Virginia? The Ashby Inn and Restaurant’s Tom Whitaker hails from Hexham, in the north of England. “There’s no greater thing in life than the love of food,” he said. “It can evoke memories from childhood dinners, pub lunches with the family, comfort you in times of distress, and elevate enjoyment in times of happiness.” This curative, almost nostalgic approach to food is evident in his cuisine. There’s a warmth, a heartiness, a feeling of having eaten this before, but never quite like this. Then there’s Chef Richard Wright. Born in the Philippines, Wright graduated from culinary school and cut his teeth for five years at New York’s Le Bernadin, owned by three-Michelin Star Chef Eric Ripert. 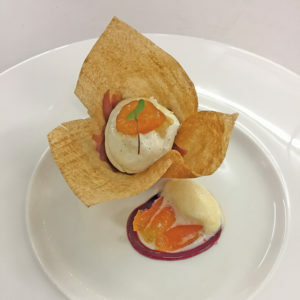 “I’d like to take the philosophy of the owners along with my own and elevate our food and give it a modern approach,” Wright said of L’Auberge Provencale in an interview with Huffington Post. “To me, it’s also important to include even more local and sustainable cuisine. 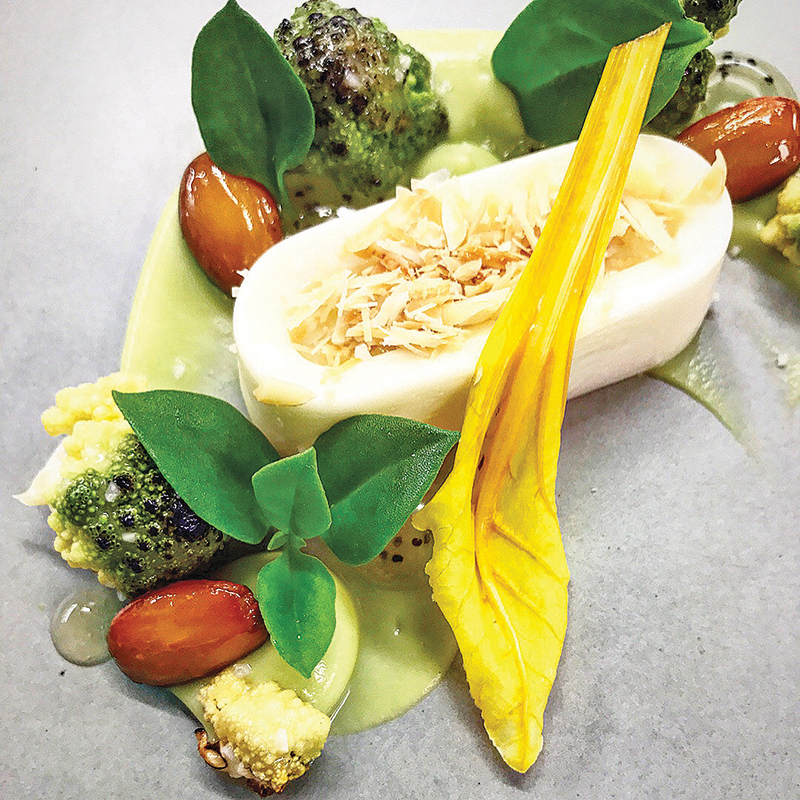 We already use ingredients from our own garden and local farms, but I’d like to do even more of that.” His intensely seasonal, as-local-as-possible approach manifests itself delightfully in his dishes. Tensions often run high in kitchens. When two master chefs are crammed into the same cramped, sweltering kitchen for hours on end, one could expect there to be at least a little bickering, if not a full-on Gordon Ramsay meltdown. Especially when those two chefs are from nearby restaurants in something like a crosstown rivalry. I’m happy to report there was none of that. No Montague-Capulet feud, no simmering Hatfield-McCoy conflict. Merely by tasting their dishes, by admiring the harmony of their composition and presentation, I could tell that there was a spirit of collaboration, of teamwork, of mutual inspiration. Okay, I’ll stop now. Without further ado, the menu! This is important. I mean, picture yourself seated at a table—pristine white tablecloth, low ambient lighting, a glass of sparkling wine and an empty plate, and this secret menu right there before you. Your imagination runs wild. Quail and duck? Veal sweetbreads? And what, exactly, is “The Broadway”? Your mind races as you try to envision the possibilities, the combinations. Then the food arrives. And it’s prettier and tastier than you could’ve ever imagined. So, let’s get to the food, what say you? Not only is Christian an expert, discerning wine aficionado, but also the son of L’Auberge Provençale founders Chef Alain Borel and innkeeper Celeste. Alain is a fourth-generation chef, certified pilot, and one of Discovery Channel’s “Great Chefs of the East.” The two founded the restaurant/bed and breakfast in 1981, and together built it into the cherished destination it is today. Alain, who retired in 2013, and Celeste were seated at the table opposite mine, and I can truthfully report that they were smiling ear-to-ear at every dish that came out of the kitchen and every glass of wine introduced by their son. The second course was a Wester Ross Scottish salmon with caviar, crème fraîche, chive, and a gaufrette (a.k.a Neapolitan wafer; it’s always fun to learn a new word at these dinners!). 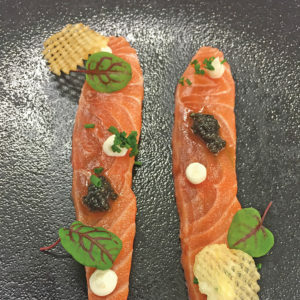 Two thin, gorgeous strips of succulent salmon with caviar that burst with flavor and the crème fraîche (somewhere between a pinch and a dollop: the perfect amount so as not to overwhelm, but rather accentuate each bite) together created a silken combination of rich and salty flavors that were punctured by the chives and playfully interrupted by the snap of the wafer. The dish was paired with a Chardonnay from Arterra Wines in Delaplane. Christian described it precisely: “This 2016 has the fattiness of a vintage that is often mistaken for ‘oakiness,’ but is actually quite light on the oak.” I’ll concede: I’m far from a oenophile, but I love when a word and a sense—image, sound, or in this case, taste—align. Christian’s knowledge of wines, his carefully calibrated taste buds, are matched by his poetic descriptions. teamed up for the Hunt Country Four Hands Dinner. Sweetbreads are divisive. The texture is off-putting to many, the metallic flavors offensive. And that’s to say nothing of what sweetbreads actually are (Hint: neither “sweet” nor “bread”). I, for one, love them, especially when they’re paired with sunchoke (or Jerusalem artichoke), salt-baked Arkansas black apple, and truffle. In fact, this was my personal favorite. As much as the balanced textures and flavors, I loved that the two chefs were willing to take a risk. The dish had such a rich, sanguine flavor that was buttressed by the saltiness of crisp apple. The tenderness was unsurpassed. The dish was complemented by the evening’s first red wine: Rappahannock Cellars’ 2016 Cabernet Franc. Vintner Theo Smith introduced the wine, which he described as “a fruit-forward blend of two different wines, one from Shenandoah County, the other from Rappahannock.” Smith was a crowd favorite. A knowledgeable storyteller with wit and no shortage of jokes, we could’ve listened to him describe the life of a winemaker for hours if we weren’t so eagerly anticipating the next course: quail with Jambon de Bayonne, tarbias bean and confit cassoulet, grilled leek garnish, and preserved tomato. 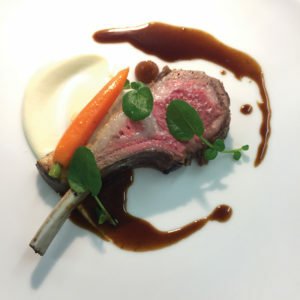 Or, more specifically, lamb with with celeriac, royal trumpet mushroom, black garlic, watercress, and date. In keeping with both chefs’ dedication to seasonal vegetables, the wintry celeriac was wonderfully hearty, nutty, and sweet. This versatile vegetable offered different tastes with each bite, an astounding example of culinary magic that would leave seasoned diners scratching their heads. Aided by the sharp, mustardy, arugula-on-steroids pepperiness of the watercress and the syrupy, caramelized black garlic, the dish was unlike any that I’ve ever had before and ever will again (unless I get really lucky). Delaplane Cellars, a neighbor of RdV, provided a red blend, Williams Gap, from 2010. Comparing and contrasting this with RdV’s blend was the highlight of the night as far as wines go. To reiterate: I’m not an experienced wine buff. I can barely pronounce terroir, much less define it or, God forbid, give you an example of it. But comparing two wines from the same year, grown from grapes in the same county, proved to be a delightful game. Whereas RdV’s was “eccentric,” Delaplane’s was lush. Both equally fruit-forward, both equally divine and well-paired with the different dishes. Surely such a comparative tasting was planned by the sommelier, and added yet another wonderful component to what was shaping up to be a memorable evening of incredible food, wine, and conversation. What’s left to say? Do you harbor any suspicions that this course was any less magnificent than its predecessors? I hope not. The mulled apple tartlet was charged with candied bits of fruit. The warmth of the pastry and the cold tang of vanilla ice cream melded together and accentuated the complexity of the wine. The pastry was reminiscent of a fortune cookie, and I felt fortunate indeed. 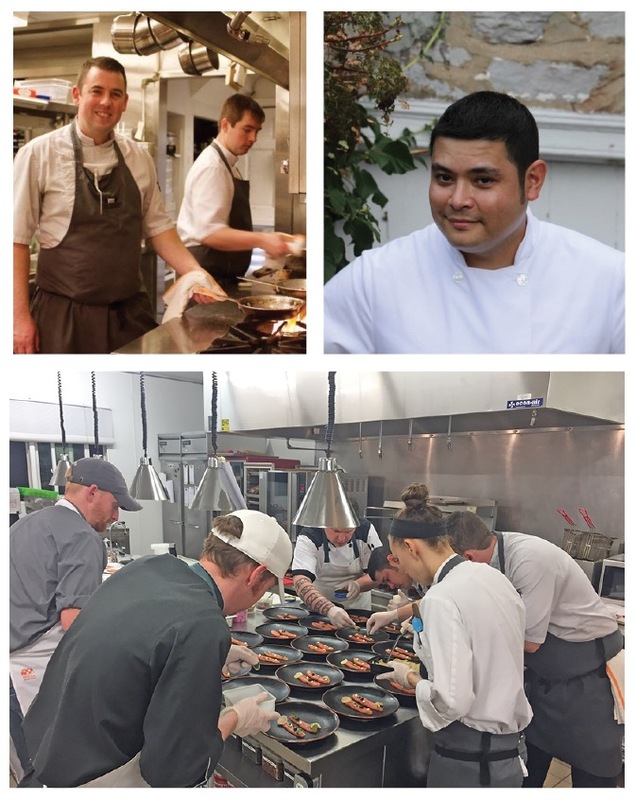 Fortunate to have been a guest, fortunate to have chefs such as Tom and Richard who work together to provide diners with an unforgettable experience. I’ll be there next time. Of that I’m sure.